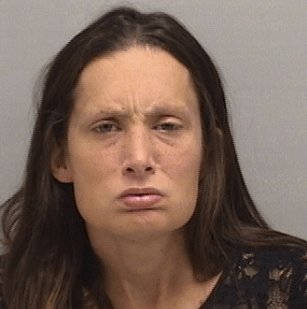 On June 19, Orange Police responded to the Chase Bank at 262 Boston Post Road, at 2:46 p.m. in regards to a fraud complaint. During the investigation, officers learned that Amy Capozzi, 33, of Waterbury, was inside the bank attempting to make a withdrawal on an account that did not belong to her. According to police, upon questioning, Capozzi admitted that the identification she carried had her picture, but the information was for someone else. She was subsequently taken into custody and charged with first-degree forgery, second-degree forgery, criminal impersonation, attempted fourth-degree larceny, two counts of third-degree identity theft, Illegal possession of prescription drugs and violation of probation. During processing, she was found to have prescription medication on her person that was not prescribed to her. She also had a warrant with the Milford Department of Probation. That warrant was served as well. Capozzi was held on a total of $20,000 bond, for court on June 20. An Orange man was sentenced Wednesday to 57 months in prison for defrauding a company out of more than $2.5 million and forcing it to go out of business, costing about 40 people their jobs. Deirdre M. Daly, U.S. attorney for the District of Connecticut sent out a press release detailing the case history of Edward Petrucci, 58, of Orange, who pleaded guilty to one count of wire fraud and one count of mail fraud in November 2013. Petrucci operated Womco Insulation, Inc., Incor Group, Inc., D & N Insulation Company and Petco Insulation Company, all of which were West Haven-based companies that performed construction services, mechanical insulation and asbestos removal in large-scale building projects in Connecticut, New York, Massachusetts and Florida, according to the release. In 2006, shortly after being released from federal prison for filing false corporate and personal tax returns and evading payment of more than $1 million in federal income taxes, Petrucci started doing business with Platinum Funding Services, LLC, a New York factoring company that provided funding to client companies, the release said. Petrucci was previously unable to secure funding from a bank. At the beginning of the business relationship, Platinum regularly purchased Petrucci’s invoices from legitimate insulation jobs throughout the state and collected them without issue. From December 2007 to April 2009, however, Petrucci defrauded Platinum by causing his companies to sell invoices to Platinum that he knew were fake, and were for work that his companies had not performed or would not perform in the future, the release said. Petrucci’s companies received more than $2.5 million from Platinum during the scheme, the release said. The scheme forced Platinum out of business. Petrucci is ordered to pay restitution in the amount of $2,979,972.53. His prison sentence will be followed by three years of supervised release. Orange police were dispatched to Best Buy, 53 Boston Post Road on a fraud complaint Jan. 29 at 4:06 p.m.
Investigation revealed that two New York residents had attempted to use fake identification to sign up for store credit and purchase $2,969.97 worth of merchandise. According to the report, store employees recognized the application as fraudulent and contacted police. Allsion McVey, 23, of 2252 7th Ave, Apt 5A, New York, NY and Daquan Bruce, 28, of 10923 24th Street, Queens, NY were taken into custody. McVey and Bruce both were charged with third-degree larceny, three counts of second-degree forgery, third-degree identity theft, making a false statement to procure a credit card, criminal impersonation, sixth-degree larceny and conspiracy to commit each of the previously listed charges. McVey was held on $10,000 bond for court Jan. 30. Bruce was held on $15,000 bond for court Jan. 30. An Orange resident, who ran four contracting companies out of West Haven may be heading back to federal prison after waiving his right to indictment and pleading guilty to Wire and Mail Fraud before a U.S. District judge in Hartford on Nov. 7. Edward Petrucci, 56, of 414 Northwood Ave., Orange pleaded guilty to a $1 million fraud scheme. See full story and photos HERE. In May 2005 Petrucci was convicted of tax fraud and sentenced to federal prison.